I posted an edited photo (below) of my circuit boards dress and got some really helpful comments. So helpful, I thought I’d go back and re-edit the same photo (second photo). I think it’s much more subtle of an edit and I can only now see that the first edit is over the top. I’m a persistent thing. Here are new photos of the same dress. You might not be able to notice but I’ve made the alterations to the fit that I wanted to make. It was really noticeable from behind but you only get to see the well fitting back. I do like showing before and after photos but for now I’m going to try to concentrate on the photo editing. 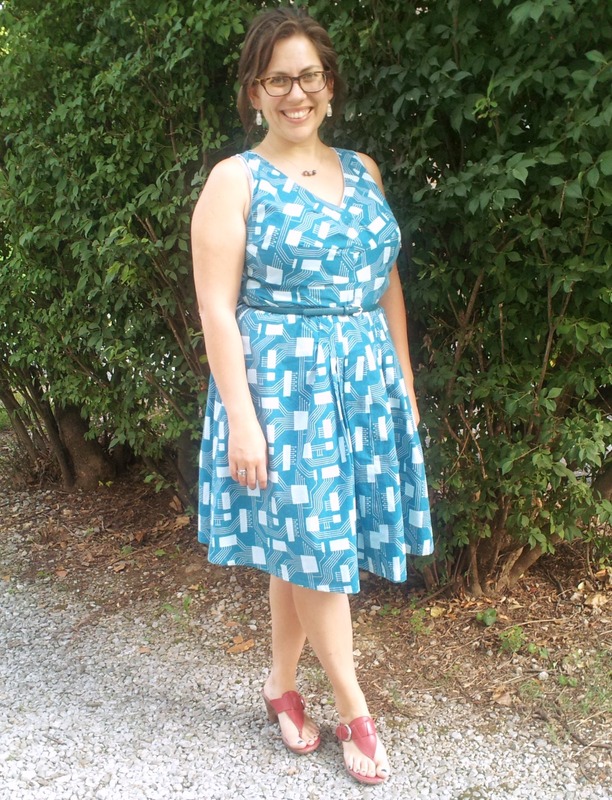 I’m more likely to wear this dress with my burgundy converse and I just might have worn this look to GenCon 2012. The next three photos were from a bunch taken just before sunset and with the white balance adjusted before shooting. I took some time away from photo editing and it was only then that I saw how overdone Photo 4 is compared to this next one. I love this last photo. The back of the dress does fit this well in person. The invisible zipper is well installed and the lining is doing its job of helping shape the skirt and smooth out the bodice. Linings FTW! I’m so happy but still just fiddling with how to photograph something I’ve made and I’m proud of so that it draws the attention of the reader. I wonder how much of my frustration with this particular photo session is due to the fabric I’m photographing and how much of it is light/color balance. Do you make color decisions based on how well they’ll read on your blog? Also, what’s your favorite photo? Look at you!!! Love the new blog (sorry haven’t been by for a while!) and the fit on your back is just spectacular. Bravo. Yes, I do choose fabrics based on how well they might photograph. Now I do… I’ve had too many garments that are awesome in person look super MEH or weird in photos. Black, charcoal is generally out. Which is good because I used to wear too much black and had to go on a black fast anyway. Pinstripes look not so great, either. If I want a cut/fit to stand out, I absolutely opt for solids. There’s just no two ways about it. And lighter colors work best. It’s something I only started thinking about in the past few months, but boy do I ever think about it…. Thanks for stopping by! I’ve been missing you…but I’m also very excited for you and your Cake patterns. Thanks for the pointers on colors…pinstripes, eh? Well, I might have to go fabric shopping with my camera now and take pics from a distance. thanks! My favorite is the last one, because it shows the most personality, though the tree on the left is a bit distracting. I’m enjoying seeing your photo challenge! Now that you mention it, that tree is pretty distracting. thanks for stopping by. Wow wow wow! Amazing improvements! I suppose I choose fabric that looks better in photos – side effect of being a costumer since I’ve been trained to dress people for camera, so I sort of do it out of habit. I hate black or anything that is dark without texture. White-white is usually too bright and washes out easily (that’s why I am always wanting to tech or cut the white a little with a slight over-dye – like the tea-dyed lace for my princess slip). And I almost always hate large high-contrast prints (especially black & white). Many times, I will put fabric over a chair and stand across the room to see how it looks from a distance. Since most people only see me from a few feet away unless they are talking to me, I know it is how an outfit will look to most people when I’m finished. When viewed from a distance, it’s also more like you see it in pictures. I actually decided to use a different sized polka-dot fabric for my current project because I did some camera tests. I wanted something that was obviously orange in small icon form (thinking about redoing my avatar), and when I took pictures of my favorite “in-person” fabric, the polka-dots were a little too close together and made the orange background look lighter than I wanted. The fabric I ended up liking better was one I thought was a little too bright in person but it looks amazing from a distance – now if I could just decide if I need to mess with knocking off the overall brightness of the fabric, I’d be set, hehe. Anyway, there’s my HUGE comment! Keep up the great work with your photos! I appreciate the huge comment! Thanks. I’m glad I went back to the same photo. It was haunting me, telling me to try again. This thing about draping fabric over a chair and looking at it from a distance is just what I was wondering. Thanks! I think my favorite is the last photo #5, except I wish you were wearing your Chucks in all the pictures 🙂 I also agree that the very last photo is lovely and eye-catching, although I also think that a post about a garment needs to show the back AND the front, especially when the fit is so impressively tailored. 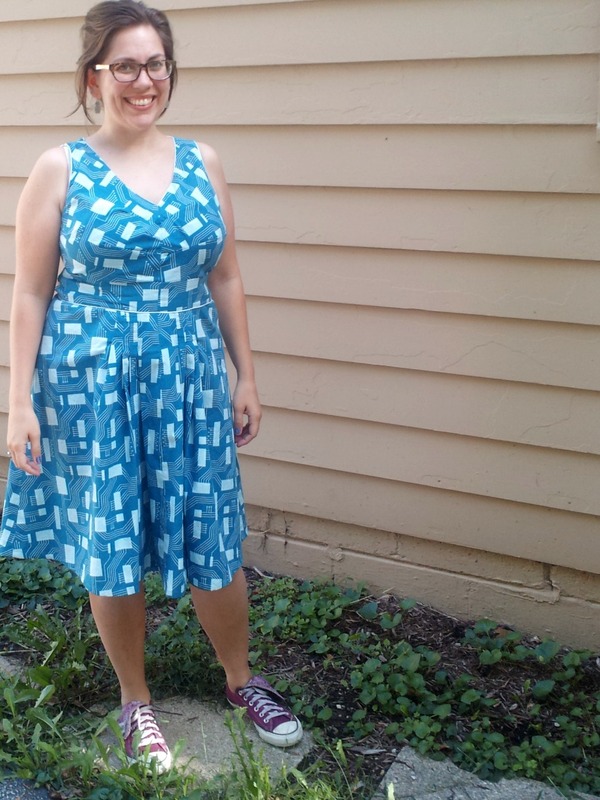 Also, though the fabric doesn’t photograph wonderfully, I wouldn’t trade the geeky pattern!!! Of course, I’m biased…. 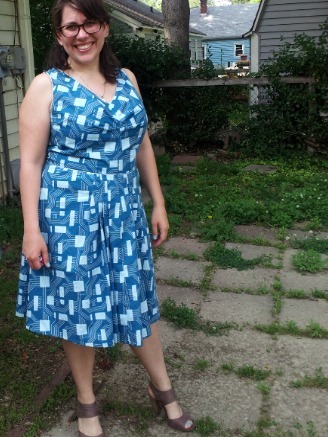 I know nothing of sewing (except to do a crappy hem and the occasional button) and know very little of photography. So, I’ll just share what my eye gravitates to. First off, I think you’re stunning. I’ve always thought that of you. 🙂 Maybe a little sisterly bias, but hey, I think I’m allowed. In any event, what I like to do is do a little blurring of the background, so the subject pops out. I especially like the picture with the house in the background because it doesn’t take away from you and what you’re showcasing. Feel free to use the backdrops you’re using, but, if you have a camera that can focus on the subject (or free photo editing apps on your phone), I’d personally go with that. It’s nice to establish a location, to a certain extent, but keep in mind what you’re showcasing. I also like off centered pictures. Our eye generally goes from left to right. So, that could be another option. I also like toying around with the sharpness of pictures. It defines lines a little better. Our eye can adjust to what we want to see and, sometimes, our cameras just pick up what’s there, given light and the sort. Boosting up colors just a hair so it pops more is made fairly easy with a lot of user friendly photo editing programs and applications. Editing these pictures to what you want people to see is sort of the approach I take. There was a picture of yours that I saw that had a vintage feel to it. I loved it! This was great for the overall feel and look, which would look great for a look book. Something to define an era. If the actual color of the garment isn’t what you want to showcase, then go for it. So, really, it all depends on what your intention is. What do you want to focus on? What do you want people to see? Again, I’m not an expert and these are just my own personal preferences. Thanks Lesa. I knew I’d want your opinion. I think you hit on something, besides your helpful tips, that even an expert will have their personal preferences. I’ll have to remember that as I move forward. I can imagine I could spend way too much time in the editing room. Besitos, manita. Your dress is lively and thanks for sharing all the photo editing, makes for an interesting read. 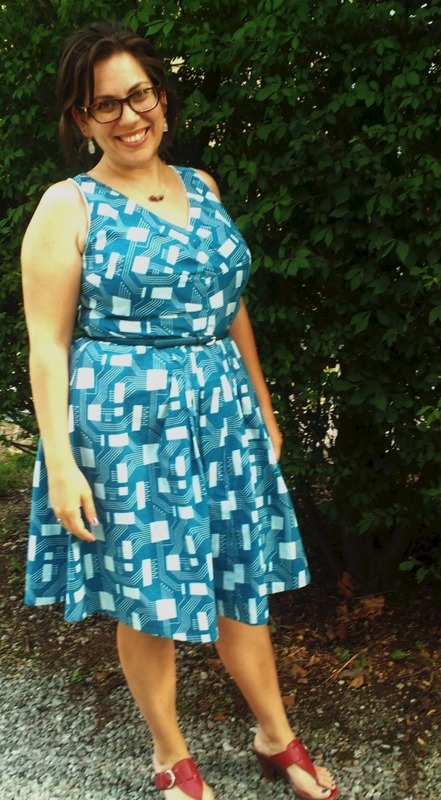 My favourite photo I use on the header of my blog – it’s a Sewaholic Cambie dress. Unfortunately it’s cropped for the header but I love the full length version. Lovely dress, gorgeous rocky beach and it wasn’t too sunny (I’m not a fan of squinting!